I'm back with two more cards.......today I 'm home ...Mom's Taxi is off duty for a while...YAY!!! time to scrap. First ....a cute Christmas card...the stamp is very cute, I don't the marker of it ..I bought it from Ebay in a lot. A Sweet card... the main cute image is from a patterned paper...all pretty in pink. PAPERS: Basic Grey, GCD Studios, K & Co., Bazzill. 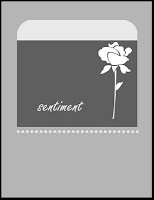 Stamps: Sentiment- Studio G, TPC border stamp. Here is Sassy Mrs. Claus from SassyStudioDesigns....Isn't she gorgeous!!!! Copics, Prismacolor pencil,OMS, ribbon, button, pearls, Fiskar border punch. Here is a cute birthday card for few challenges...... this is "CUPCAKE PEWTER" from The Character Cafe. Getsketchy: SKETCH #7- just flipped it. PaperPlaychallenges: "SPOT THIS"---- Used the polka dotted paper and flower. Pileitonchallenge: "Let them eat cake!" ----How about a cupcake!!!! 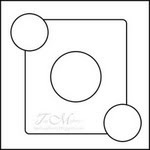 Dareu2digistamp: Die Cuts or Punched Shapes---I have both ..nesties and circle punch. PAPERS: K & Co. , DCWV--"The Green Stack"
Copics, Prismacolor pencil, OMS, Lace,Prima flowers,Brad,Ranger's distress ink. I'm back...What did I miss!!! I was just away for a weekend and lots of thing happened around the blogworld. I just joined The Character Cafe Design Team...YAY!!!!!!! Now I will have some super cute images to work with and share with you all. We will start our new venture with a blog hop on Oct 2nd. 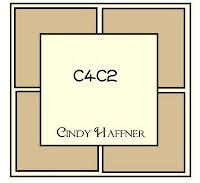 So join me for my new creations, fun, freebie and win FREE images. Stop by TCC- Store ...take a peek at the fabulous images...super cute!!! Welcome to our InStyle Stamps TREATS blog hop.Its almost halloween so here is some Yummy Halloween Treats for you all. I used this super cute Anime image for a mini candy buffet....Patches reminds me of my little one's 1st halloween...she dressed up as a pumpkin..my 4 month old pumpkin :o). So lets see each Treat up close. This the first template I ever made.....but it works...just cut a cardstock 6 1/2" x 3" and score it at 2 3/4" and 3 1/4"...punch a hole for the lollipop stick ...finally cut a half circle to hold it shut. I used a dime and cut around it...you can use SU slit punch too. "What is your favorite fall treat?? Its thursday already, its a super busy week.... going by quick. I'm back with another fall card....just love the rich colors of fall so much ,I can make a whole bunch of them. DigitalTuesdaychallenge: FALLING LEAVES----How perfect is the image???? PAPERS: Cosmo Cricket, Basic Grey. Copics, Fiskars "apron lace " punch, Ranger's Distress Ink, brads and pearls. Papers: From Joann ( last year's) --just love it. Image: Sassy Studio Designs---will be available in store on October 1st..
Cuttlebug folder, Copics, Lace and gems. Mixed some K& Co. pretty papers , Making Memories alpha stickers and a Cute Owl emb. from Recollections.....3 pearls and tiny piece of ribbon. Pileitonchallenge: Punches---I used Fiskar's Border punch~~ "Apron lace". ChristmasStampin All Year Long: Christmas with non traditional colors. I actually didn't use any patterned paper.....heat embossed the background with Hero Arts stamp.The sentiment is from Studio G.
Its time for another SassyStudioDesigns Holiday Release....so here is a snaek peek of two new images....yet many more to come. The first one ...for Caardvarks~Sketchfest.....love the fall colors....and this cute image. PAPERS: Christmas Stack from Joann ( last year's). Image : Sassy Studio Designs. Copic Markers,white gel pen, Ribbon, Glitter embossing powder,gems. Hope you all had a great weekend.......lets start the week with another sneak peek of InStyleStamps~ Halloween Release. Distressing works perfectly for PIRATE card....and love to use this technique ...I use it for most of projects. The bookmark is my favorite thing to make...one can't have too many of it... I made it double duty this time...attached a longer piece of Making Memories ribbon so that I can attach it with a Gift basket. PAPERS: Recollections and Disney Spiderman . STAMPS: Studio G---- Skull and Sentiment. 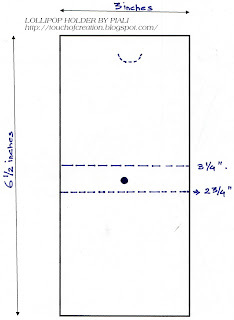 Punches: EK Success--- Scallop circle and "Boo" Border. Copics, Distress ink, white gel pen,bling. 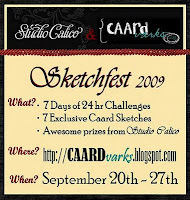 Today is the first day of Caardvark's Sketch fest...six more to go ..hope to make till the end. Papertakeweekly: Faking It........... I faked the stitching--- its actually white gel ink marks and the twisted the narrow strip of paper to from the swirl.. IMAGE: InStyleStamps--- " CHEF JULES"
Copic markers,Cricut , white gel pen,bling. Yesterday....I found this beautiful image while surfing , its from Mo's Digital Pencil...just love how she is looking up at the butterfly....very cute. SweetStopSketches: SKETCH with a SPIN....use Red,Black and Tan only. BasicGreyChallenges: Embossing--- I used CB "Swiss Dots" and Distressed lines"
PaperManiacChallenges: Ribbon- -I used MAKING MEMORIES ribbon and sponged it with Tea dye distress ink to make it tan-ish. Paperblooms: BLING---- Four blings on the corners. TuesdayTaggers: Diecuts and Punches---EK Success border punch and Nesties label die..
StampSomething : Favorite paper or colors----My fav Basic Grey paper and favorite colors..cranberry red ,black and tan. Supplies::::: Paper: Basic Grey, Image: Mo's Digital Pencil, Cuttlebug folders,Copic Markers,ribbon,bling. Time for another Pam's TOUGH sketch....I tried to follow it totally. 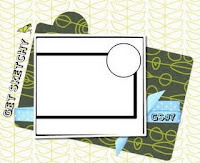 I like it ...its kinda cute...a small tag card....will be perfect on a gift . 2redbananas: EASY 1,2,3.....----1 ribbon,2 stamps and 3 gems. 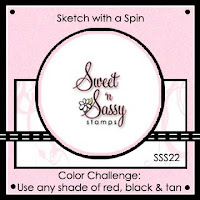 I used two stamps-----the Sassy witch from sassystudiodesigns and the sentiment stamp from whimsiedoodles. The sparkles around the scallop circle are Stampendous sparkle stickers. IMAGES: SSD and Whimsie doodles. Copics, Colorbox chalk ink, Stampendous stickers, ribbon and Gems. Time flies......its almost end of September....Halloween will be here before we know it.I am getting ready for Halloween slowly....we plan to "BOO" few of our friends again this year.....my daughters just love to leave the goodies at their door and hide in the bushes ......super fun . "TEA SOCIETY CYNTHIA"-----isn't she super cute!!!! I used lots of glitter ...as always I am a mess when it comes to glitter photography....hope you all can see the web is so sparkly....so are the polka dots....I just love this image...super,super cute. As its related to tea party ...I used a mug ( I'm a coffee person, don't like tea much) as my treat holder. Copic markers, ribbons( Michaels),MS fine glitter and Spica pen. I will be be back with more ISS Halloween release sneak peek tomorrow...be sure to stop by..
Have a happy crafty day :o). I was too late for last Getsketchy challenge...when I was ready to post Bree had new challenge up...........so this time I did this on the first day...lovely sketch....and more tough one is the bonus challenge ~~NO PATTERNED PAPER. So I tried to do something cute for a friend..... used Bazzill cardstock and all background stamps and created my own PP . The first one ...is a fall card . DigitalTuesdayChallenge: CLEAN AND SIMPLE FALL. PAPERS: Basic Grey " Ambrosia"
Making Memories Brads, Prisma pencils,OMS. 365cards: ONE ,TWO , BUCKLE MY SHOE. Another lovely image from SassyStudioDesigns ...love the simple sketch. ....and now peek at the fabulous CLUB ANIME Octobet kit ......The super fun kit is packed with New Bo Bunnny "delilah"collection papers and brads , coordinating cardstocks, lots of gorgeous ribbons and cute ANIME images. Here's my card with october kit and the new ANIME image---"Bejan and Bloop"
Image: ISS-CLUB ANIME~ "Bejan & Bloop"
Bo Bunny brads, Copic Markers, Ranger's Distress ink and ribbon. 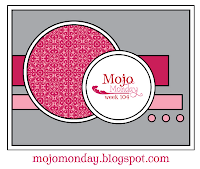 Today I found a super cute line of designer paper at A.C.Moore............"MOXXIE"...its new to me. Just love the collection they have....I picked few of them. 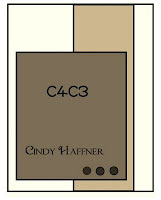 So here is my card for this week's Cardpatterns challenge. 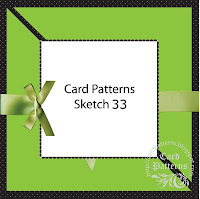 Cardpatterns is one of my most favorite and must -take challenges..and its extra special this week .....bcoz Amy is the Guest designer there. I love Regina's~Thecuttingcafe 's cut files and printable stamps....I only own a few of them but I have long wishlist for it. Okay!!! now about this card...I just love this salt and pepper shakers.....trimmed it out and created a cute card...inside it says " for you" ...I plan to send this card with a gift basket...How about that??? 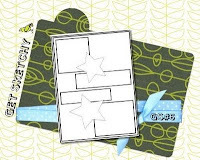 This card is now perfect for Moxiefabworld ~ household item card challenge.....WoW!!! 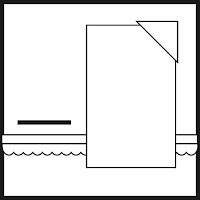 its Moxxie paper card for MOXIE FAB WORLD....lol. PAPER: MOXXIE---" Made from Scratch" collection. Over the Hump Day Blog Candy Give-a-way!! !